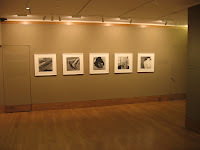 Comments/Context: With the big shows at the New Museum last year and the Jewish Museum right now (both linked below), it would be easy to conclude that New York has had plenty of chances to get up to speed on the work of South African photographer David Goldblatt, and that therefore, this smaller gallery show (unbelievably, his first gallery show ever in New York) would be one to pass by. Think again. Rather than opting for a"one of everything" mini-retrospective selling show, Howard Greenberg has smartly chosen to focus on a single, tightly edited photographic project and show it in more depth. It's a compelling, self-contained body of work (no pun intended), highlighting the more intimate and personal side of Goldblatt's photography. The images themselves are all up-close, frame filling fragments of bodies: legs and feet dangling from park benches, folded arms, hands resting in laps, and limbs splayed on the grass. Goldblatt has a sharp eye for detail and proportion, for bulges of clothing, textures of fabric, and the small signifiers of age and class found in jewelry, hairstyle, shoes, or the cut of a suit. Like all of his work, these pictures document the cultural mix of black and white that is embedded in everyday existence in South Africa, but without taking sides; a broad spectrum of skin colors and economic conditions can be found in these chopped up forms. The prints themselves bear all the hallmarks of masterful black and white craftsmanship, especially in their tactile contrasts of tonality: the deep black of a coat sits atop spiky silver grass, a hairy chest peeks out from a dark shirt, and wrinkled black hands cradle a warm glow. Image to image along the wall, it's a consistently impressive display of compositional control. So while the massive museum shows are doing a respectable job of educating us about the broad sweep of David Goldblatt's many talents and long photographic career, don't miss the chance to get beyond the big picture, to get down a step further into a more comprehensive look at his elegant and original approach to a commonplace subject. 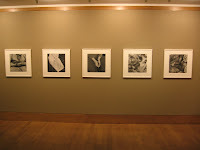 Collector's POV: The later prints in this show are all priced at $6000 each. 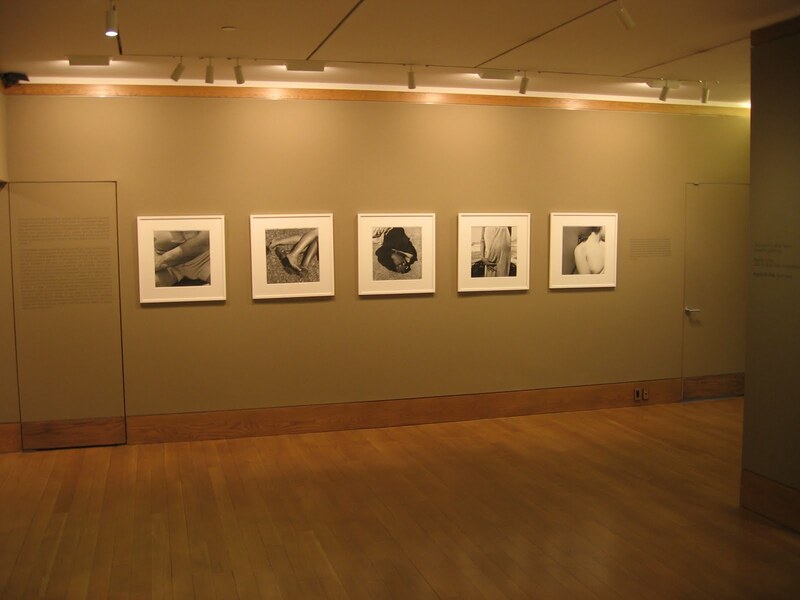 Goldblatt's work has not been widely available in the secondary markets in recent years, so it's difficult to discern much of an overall pricing pattern for his prints. 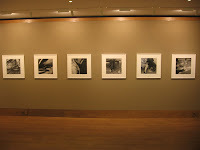 David Goldblatt is also represented by Goodman Gallery in Johannesburg (here). 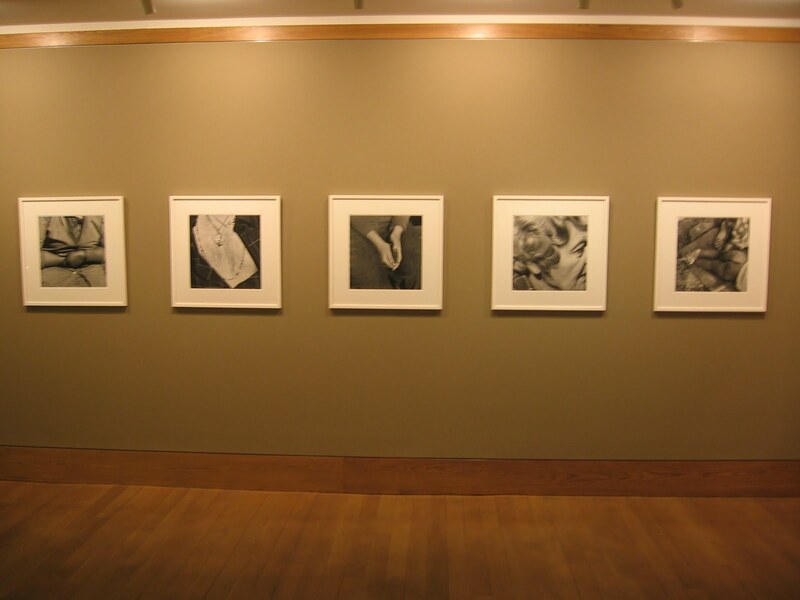 As an aside, I think Goldblatt's up-close bodies will appeal to those who like the abstraction of Bill Brandt's nudes; Goldblatt's images are cripser and less distorted, but are in many ways rooted in the same geometries of human line and form.